EZ Diet Note: I distill my cooking and drinking water from triple filtered well water. But I still grab one of these 40 bottle Kirkland Signature Purified Drinking Waters from Costco for when I’m out of distilled water and for travel. It’s just $2.99 for 40 bottles, (about 8 cents each after tax), plus the bottles are BPA free, fluoride free with added minerals for taste. Kirkland Signature Water comes from a safe source and is thoroughly purified. It does not test positive for contaminants and is not bad for you. Kirkland Signature Water is distilled water from the Rocky Mountains near Kirkland, Colorado. They source their water from the city of Kirkland, which gets it from the Cedar River Watershed and the South Fork Tolt River Watershed. They consistently use clearly identifiable sources. These sources are not significantly polluted because they are in a remote location. The reviews of Kirkland Signature Water are overwhelmingly positive. Customers claim that it tastes good; that “it tastes clean” and it’s “crisp” and “smooth”. 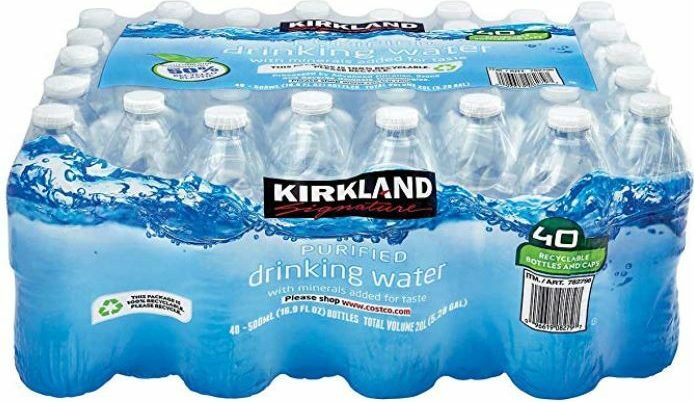 Kirkland water is sold at Costco and it’s very affordable. The plastic is very thin, meaning it is less wasteful and less harmful to the environment. However, they should be gripped lightly after opening so the water doesn’t spill all over the place! The bottles are 100% recyclable. Kirkland Signature Water bottles do not contain BPA, a chemical found on many plastics that is harmful to your health if ingested. Kirkland Signature Water does not contain fluoride, which many other bottled waters do. Those who are especially concerned with fluoride in tap water and bottled waters have the option of using this very cheap brand of bottled water. 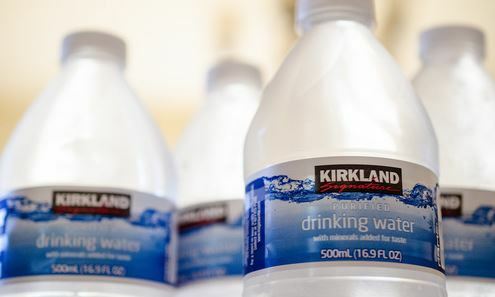 The manufacturer for Kirkland Signature Water is a company called DS Services, which is a member of the International Bottled Water Association. There are strict regulations in place for all members of the association. DS Services uses extensive filtration and reverse osmosis to purify their water and uses ozone and ultraviolet radiation to disinfect it. Distilled water also goes through a water softening process to remove minerals, before they add their light blend of minerals that are often found in food in order to enhance the taste. Certified labs have tested Kirkland Signature Water and found it to be contaminant free. Their water quality analysis tested for inorganic chemicals, metals, dozens of kinds of harmful organic chemicals, and radiological and other contaminants. The results indicated very safe levels for all contaminants tested for. There were measurable levels of many of these before purification, yet very few of them were detectable and none of them at dangerous levels after the purification process, which clearly demonstrates its effectiveness. The pH of Kirkland Signature water is 6.0, slightly acidic. You can feel safe drinking Kirkland Signature Water.